This Valchromat display unit was kindly photographed by Greg Parsons, who has copyright in the photographs. 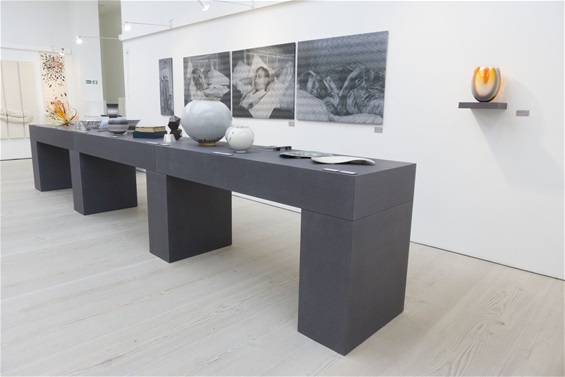 The 3 x 2 metre long top units and 4 x 780mm high x 700mm deep x 350mm wide plinths were brought together for the first time at the March 2018 Collect exhibition in London. Each plinth has a flush fitting mitred door and shelves. The top, flush fitted surface of the display can be swapped out for Perspex to allow visible and protected display within the top unit. Designer & maker of contemporary furniture and games. Based in Chester, Cheshire I design and make bespoke high quality, traditionally constructed contemporary furniture and games mainly in wood but incorporating other materials such as glass, slate, stone and metal. Specially selected hardwoods, locally and sustainably sourced where possible, are used with the natural beauty of the timbers always being featured. My most recent work has become more sculptural, with textures achieved through scorching or carving. If you require any information such as pricing or availability of certain items, or want to discuss the commissioning process in order to share in the design of your own unique item of furniture, simply call or email. "The commissioning process continues to delight, with recent projects including a lit display case for one of the Tower of London poppies to be housed in Chester Cathedral and a chair specifically fitted to a client, calling on my previous life's work designing seating in an NHS specialised physiotherapy unit. The design process is always a pleasure, combining a client's thoughts with my ideas." Have you "Liked" my Facebook page?